What is the Leatherback Turtle? Leatherback turtles are the largest living turtles currently. Adult leatherbacks might be 8 feet (2.4 meters) long, 12 feet (3.6 meters) wide from front flipper tip to front flipper tip, and weigh about 1,600 pounds (725 kg). The leatherback is also known as a luth. The leatherback is the only living turtle having a shell made up of skin which has innumerable small bones embedded in it. These bones provide the shell of the young a mosaic appearance, however in the adult the shell’s surface is smooth black skin. Seven prominent longitudinal ridges extend down the carapace, or upper shell, and five down the plastron, or lower shell. The leatherback’s limbs are clawless and paddlelike. Females ascend tropical beaches to excavate nests. In Ceylon, where the first nesting observations were described, a female was found to lay 90 to 130 eggs in a single nest, which was almost spherical and about 3 inches (6 cm) in diameter. The peak of the breeding months are in May and June, however the females lay three or four times annually. Leatherbacks usually go back to the beach of their birth to lay their eggs but they could also choose beaches in the general area as their birth beach. Major nesting sites in the Pacific include Central America, eastern Australa and Indonesia. Major nesting beaches in the Atlantic are western Africa, north eastern South America, Central America and the Caribbean. Small colonies of leatherbacks have also nested on the coasts of North Carolina and Florida, and for the first time in 70 years, a leatherback turtle nested on the Texas beach in 2009. The leatherback (Dermochelys coriacea) is the only living member of the specie Dermochelyidae, in the class Reptilia and order Testudines. These turtle’s hard shell is known as the carapace. The shell is attached to its skeleton. It is made of several bony plates. The plates fit together like a puzzle. The leatherback turtle is flatter than other turtles so that it can swim better. It also has flippers instead of legs. Although a leatherback turtle has a softer shell, it is tough enough to protect it from sharks. Leatherback turtles can be found in all the oceans of the world except the Arctic. As they are cold blooded they like warm waters. They usually stay in calm shallow areas. They are found in lagoons, bays, estuaries and coastal waters. Leatherback turtles also enjoy burying themselves in sand or mud. When it becomes cold a leatherback turtle travels a long distance to find warm waters. A they may travel thousands of miles every year. As it travels in the vast ocean it does not lose its way. Like a sailor uses a compass it uses the sun, moon and stars to guide it. Leatherback turtle’s ears are covered by thick skin. Although their ears are invisible they can hear verywell. They can hear low-pitched sounds as well as a human. A leatherback turtle has a very sharp sense of smell. This is its strongest sense. It can smell better than a dog. It also has very good eye sight. This helps it to see well in the dark. It uses these senses to find food and know if an enemy is near. A leatherback turtle does not have teeth. Instead it has pointy and sharp ridges along its upper and lower jaws. It uses these to cut its food before swallowing it. Leatherback turtles are omnivorous and can eat sea plants and grasses. Their ridges look like the edge of a saw. It uses these to easily tear off tough plants. A leatherback sea turtle diet may also include small fish and jellyfish. They have ridges that are as sharp as knives. Their jaws are also very strong. Once it grabs a passing fish with its jaws, it cannot slip away. Like all turtles a leatherback turtle moves slowly on land. In the sea, however, they are very fast swimmers. Their paddle-like flippers and the shape of their shell helps a lot in moving through water. Leatherback turtles cannot rely on its shell for complete protection. So it swims fast to escape from its enemies. One among several interesting leatherback turtle facts is that some leatherbacks can make a quick escape by swimming 20 mph (miles per hour). A leatherback turtle spends most of its life in the sea, but goes to shore to lay eggs. 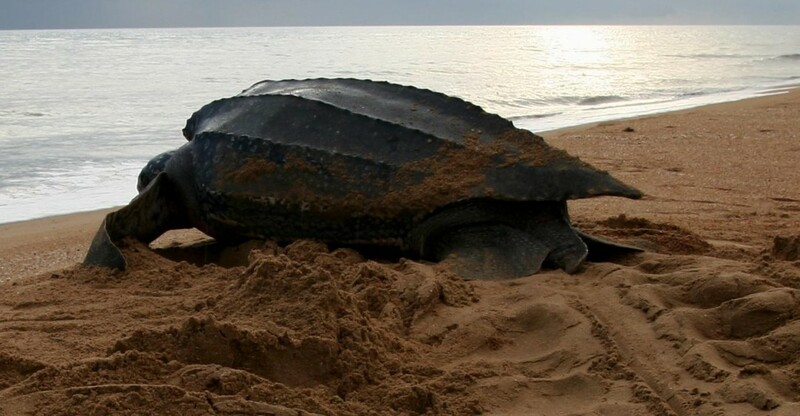 A female leatherback turtle returns to the beach where she was born just to give birth. Once it is on the beach, she has a hard time walking on the sand. Still she will keep walking until she finds a safe spot for her young. When she finds a place that is away from high tide, she digs a hole using her hind flippers. This is where she lays her eggs. She then covers the eggs with sand to keep them safe from predators. Then she goes back to the sea. The nest of eggs that a turtle lays is called a clutch. In a season, a mother leatherback turtle can lay four or more clutches. Each clutch has about 100 eggs. A bird’s egg is fragile. A leatherback turtle’s egg, however, is tough as leather. It is almost the size of a Ping-Pong ball. The sand warms the eggs and incubates it. In about two months the baby turtles hatch and find their way to the sea. What are the predators they face? Why are leatherback sea turtles endangered? In recent decades the species of leatherback turtles have experienced a worldwide decline due to several factors. The breeding grounds of these turtles have suffered greatly from industrial development, especially in South America and Central America. Beach erosion through severe storms has broken their nesting sites. Poachers have been known to raid the turtle’s nests for the meat and eggs. Artificial light from beach front hotels and restaurants attracts the newly born turtles away from the ocean, making these turtles exceptionally vulnerable. At sea, many leatherbacks have drowned after they were knotted in fishing gear. These turtles also eat ocean debris, to their misfortune: plastic totes are often fatally mistaken for jellyfish, which is the favorite food of leatherback turtles. Leatherbacks are currently on the international list of species that are endangered, making it unlawful to harm or kill a leatherback turtle. Conservation initiatives throughout the world include 24-hour seaside patrols by trained personnel to protect the breeding grounds of these turtles. These initiatives are assisting these magnificent turtles to regain their footing.